The White-bellied Caique inhabit the forest canopies in tropical zones in Brazil along the upper Amazon river. White-bellied Caiques have a mostly orange coloured head, with the sides of the head and throat being yellow. The back and wings are green and the breast and belly are primarily creamy-white. 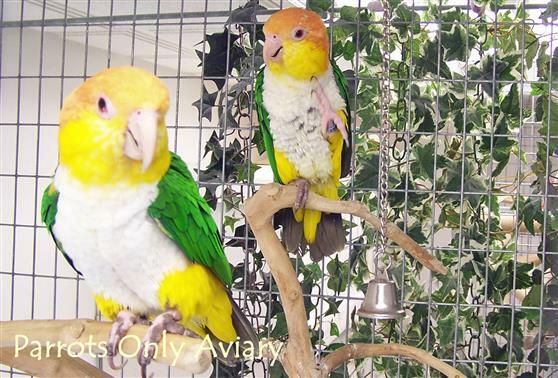 The young White-bellied Caique's head is more brownish with scattered black feathers. Caiques enjoy human interaction and are highly social birds with a very active nature. They will require a lot of interaction from you or from another companion. Despite this affectionate nature, some can get rather grumpy and nippy and can be aggressive to other birds. They should never be left unsupervised with other pets. Average about 25 years, depending on nutrition and care.